were filmed here, as well as several other scenes (Lars Farmstead on Tatooine). 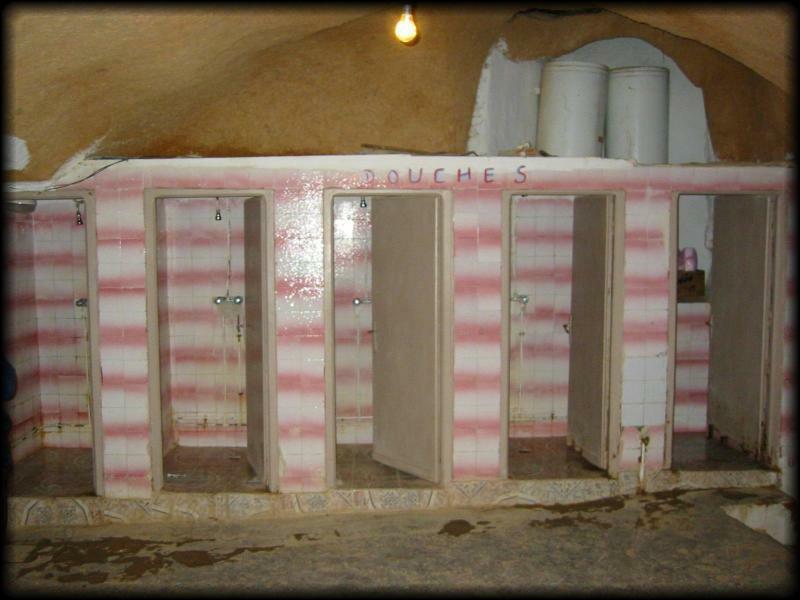 The hotel isn’t very expensive, and consists of several underground cave rooms. The traditional homes in the area are actually built into the ground like this, because of the desert extremes of temperature. Most rooms are set up in a sharing arrangement and have quite a few beds in them – we got one of the only ones with only two single beds. 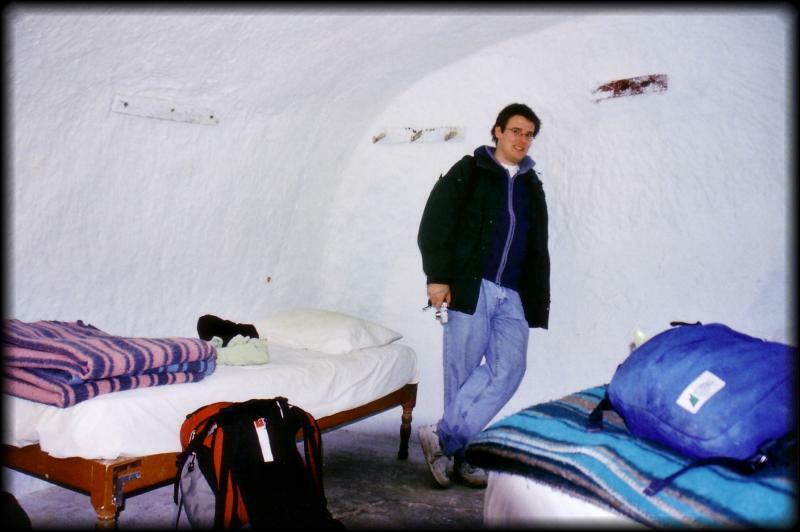 The only thing in the cave was a bed (with no bedding, as such). There was no lock on the door, although if you had your own you could lock it. To get to the restroom, we had to cross a few courtyards to get to some very claustrophobic stalls. The whole bathroom / shower situation was pretty much a disaster, with water leaking everywhere, nowhere clean to put things when you take a shower, etc. It was definitely a no-shower evening for us. We would have been more excited to stay in a cave room had we not done so a year and a half earlier, in absolute comfort, in Capadoccia, Turkey (en-suite restroom with shower), for the same price. All that being said, however, we still got to stay at the Star Wars Hotel. And we got our obligatory pictures with the parts of the place that are decorated with Star Wars movie set items. Besides wandering around the hotel, we had a walk out of the town to get a view of the pretty surrounding landscape. There really isn’t that much else to do, except to spend money perpetuating a growing industry of locals pimping out tours of their ‘authentic troglodytic living’ homes. Hi there… in addition to my previous e-mail. will you recommend us to spend a night in this hotel? We would definitely not recommend this hotel with a 5 year old. There were cockroaches in the bathroom, the shower stalls were a disaster and only had cold water. The room itself was clean. There are no rooms with bathrooms. 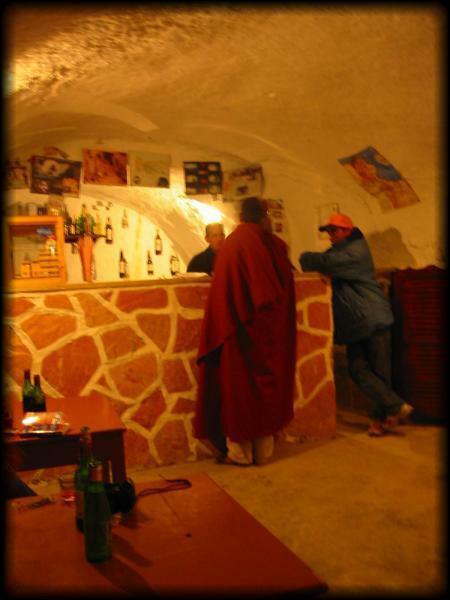 We would recommend staying elsewhere, and visiting the Cantina for a drink in the bar. They also serve dinner and you can wander around the hotel at the same time. Be very careful when booking hotels in Tunisia- in general the standard is pretty low. At least you won’t be there in the winter – we often found that there was no hot water or heat. The Sidi Driss Hotel was actually the shooting location of the Lars Homestead (Luke Skywalker’s house), not the Mos Eisley Cantina. 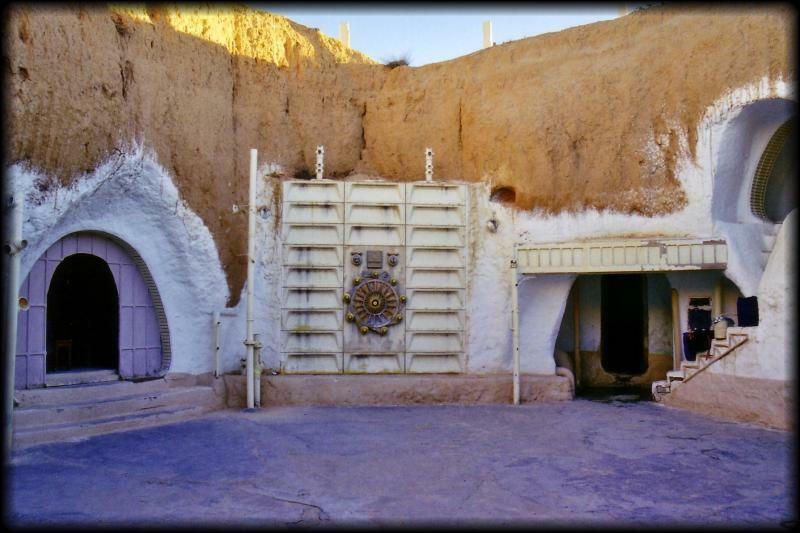 The exterior cantina shots were filmed in Djerba and the interiors were filmed on a constructed set in London. Thank you for the review, though. I am planning on staying here and this review was far more informative than most. You can actually visit these places? I thought they just tore them down after the movies were filmed. That’s incredible! Adding it to my list. No, I think we just called in advanvce, or just showed up. We were travelling off-season. Good luck!